cleaner and a general-purpose cleaner from a common set of chemical inputs (NPR). 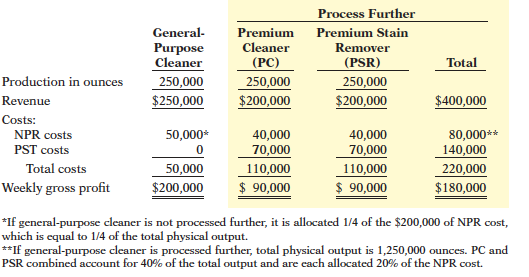 750,000 ounces of appliance cleaner and 250,000 ounces of general-purpose cleaner. based on the following analysis. cleaner further by doing the following. cleaner is not processed further. (3) Compare the resulting net incomes and comment on management’s decision.